The best stereo amplifiers of the 21st century | What Hi-Fi? The stereo amplifier is the essential engine of any hi-fi system, driving music from your source to your speakers. It may offer an ever-widening selection of connections and features, but ultimately for us here at What Hi-Fi? it all comes down to outright sound quality. The stereo amps listed below are our Product of the Year Award recipients from the last 18 years. They’re not necessarily the one and only excellent product you could buy at the time, but rather they represent the best performance-per-pound amps to pass through our test rooms that year. There's some classic kit on the list, from brands both long-established and relatively new. If you can find any of these amps on sale, you’re in for a treat. And you know your music will be in good hands. The NAD C370 was our favourite amp for two years running, despite being "no looker" - but then it's not alone in that department. Fending off competition from the likes of Marantz, Rega, Cyrus and Arcam, the C370 impressed us in all areas, from its sheer power to its ability to be controlled and delicate when needed. NAD made it three wins in a row with the C320BEE. This £220 budget amp was a descendant of the NAD 3020 from 1978, and a clear example of how to produce a perfect performance-per-pound product. We said the C320BEE was a “genuinely stunning amplifier for the money”. 2003 saw a Product of the Year win for Cyrus, a company not unused to picking up What Hi-Fi? Awards. The 8’s stereo imaging was typically Cyrus: expansive and precise. Quite simply, the Cyrus 8 didn’t put a sonic foot wrong and was a well-deserved winner. Despite being one of the more expensive winners, we said it was a "competitive" price and, all told, the amp was "a star". Rotel had won a few Best Buy Awards over the years, but in 2005 it got top prize with the RA-03. This spectacular all-rounder was refreshing in its ability to be fuss-free when system-matching, and the built-in MM phono stage for adding a turntable was also pretty decent into the bargain. Roksan already had three Best Buy Awards under its belt for the Kandy amp, but this revised version brought home the Product of the Year bacon. Virtually every component had been upgraded and the result was a spectacular-sounding amplifier, capable of handling any kind of music thrown at it. As for the name, the 'L' makes sense when you remove the lid and see the L-shaped layout inside. We called the Kandy K2 the best Kandy amplifier to date. It was a brilliant all-rounder that bettered its (Award-winning) L.III predecessor in every respect. Its presentation was full-bodied, detailed and well organised, and we had no trouble recommending it to, well, pretty much everyone. And- hold on to your hats - we heralded this amp as "immensely well made" and even gave props to the classy, programmable remote control. The 6XP was an incredibly versatile amplifier, able to be upgraded and customised in a number of ways. But as an out-of-the-box unit it was something of a belter - it delivered sound with incredible scale and dynamism, with low frequencies that had more depth than Cyrus had previously been known for. We loved it so much we awarded it a Product of the Year gong two years running. Marantz was no stranger to winning Awards for budget amplifiers, but the PM6004 really was something special. It was the result of a complete internal revamp which saw integrated circuits switched out for separate pre- and power-amp sections with discrete components. The result was a well-balanced performer that perfectly mixed refinement, insight and attack. Its successor, the PM6005, would go on to win the Best Buy Award for budget amplifiers in 2013 and 2014. The RA-10 was a surprise winner to some, as the Rotel name hadn’t been associated with class-leading amps for some time. Nonetheless, the RA-10 was a well-deserved winner, delivering an entertaining and engaging sound that kept us listening for hours. It even saw off the pre-tournament favourite, the Marantz PM6004. Arcam's Full Metal Jacket range delivered the Product of the Year winner for 2013 and 2014, marking a return to two-channel amp supremacy for a brand which has, at times, dominated this category. It's all about stability and composure here, with the Arcam A19 delivering a quietly composed but brilliantly transparent sound that should suit pretty much any system. Cambridge made a welcome return in 2015 with the CXA60, the sleek design and upbeat, likeable sound of which made it a shoo-in for the Product of the Year trophy two years in a row. Despite a modest price hike up to £580, our regining champion "remains the most exciting-sounding and competitively-featured" amplifier of its type. 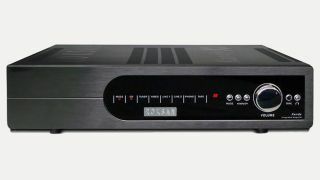 We'd long admired Rega's Brio-R amplifier, but the Brio improved on the recipe in every way. This is a terrifically musical amplifier with a greater sense of energy, more muscle, a better instinct for dynamics, and a surer grasp of rhythm than anything else close to it. It's still smashing all expectations two years in a row.